Appropriately used carbon fiber is something of a miracle material. It is strong, light, stiff, and resistant to fatigue. 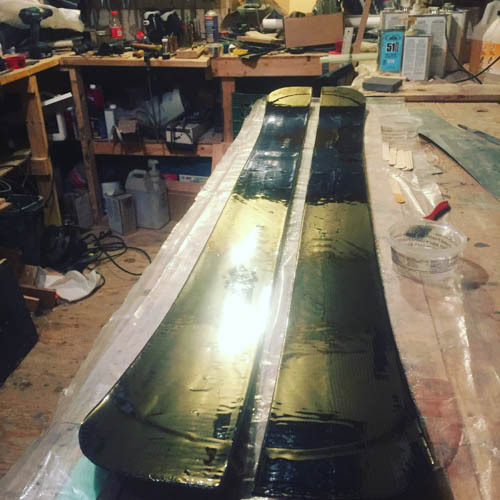 Assembled with epoxy resin in an appropriate configuration carbon fiber allows for the manufacture of light yet powerful skis and snowboards. It allows for a high degree of damage tolerance and long lifecycles. The highly directional nature of carbon fibers stiffness and strength allows for nearly infinite variations in tuning flex: this allows for the production of skis and boards that are responsive and fun to ride. An examination of almost any high performance endeavor will reveal that carbon fiber is the current best solution for construction in these contexts. Aerospace, Formula 1, automotive racing, bicycles, tennis, golf, fishing rods, the list goes on and on. Carbon fiber is the right material if the product has to be strong and stiff, while still being light. I was an early adopter of carbon fiber for all of these reasons. Currently, in the ski and snowboard context carbon fiber is prevalent where weight is of paramount importance: touring. Splitboards and touring skis are the early adopters of carbon fiber. This makes sense: reducing ski and splitboard weights while climbing (about 85% of your day) makes things so much more fun. Further, the design of these skis and boards tends to make them bigger. Skis and splitboards are typically wider and often longer than their on-piste equivalents, making the weight of the structure even more dramatic. The increased strength and stiffness of carbon fiber versus glass and metal allow for using less of it while maintaining appropriate performance of the structure. Using less carbon also allows for less resin, further reducing weight. There is no doubt that weight can be trimmed through the use of lightweight core materials as well. The use of balsa, pawlownia, cedar, honeycombs, foams, etc. are all potentially viable, but work equally well or better paired with carbon versus glass or metal. There is more to building high-end equipment than weight. Carbon fiber makes skis and boards responsive and tune-able. Carbon fiber and epoxy is inherently damp while remaining responsive, compared to metal or glass. Its tendency to rebound quickly (e.g. return to its original configuration) keeps things lively. Tuneability refers to the fact that carbon fiber can allow for a large variation in the torsional stiffness versus the longitudinal stiffness of the final structure. This allows for making a board that can be, for example, torsionally stiff and relatively soft lengthwise, allowing for reduced sidecut depth. Or vice-versa. Or something else. This is more difficult with other materials (especially metal). Essentially, carbon fiber construction allows for the most efficient (in terms of versus final weight) construction to allow for the performance characteristics desired. It only is a problem if you want to make something heavier while maintaining a particular performance envelope. Finally, using carbon fiber allows for the skis/board to last longer while being lighter. This is possible for two reasons. Because carbon fiber has a different fatigue curve compared to glass or metal (typically aluminum) it tends to change less through its useful lifecycle. Secondly, careful use of the stiffness/tuneability characteristics of carbon fiber compared to glass/metal allow for design advantages that tend to last longer. Why isn’t everyone simply making carbon fiber skis and boards if it is so awesome? Well … carbon fiber is a finicky mistress, but we’ve been together for a long time. Exegi’s long experience in the use of carbon epoxy composites allows us to build better performing skis and boards. They last longer and are lighter than similar gear made of other materials, and we build them at a cost that makes them a better value.